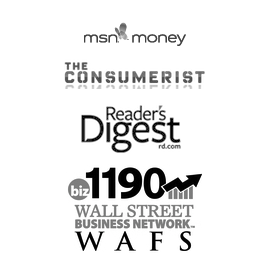 Disclosure: The post below contains affiliate links. We test each product and give high marks to only the very best. The opinions expressed here are our own. Ever since I started posting my online income reports and how I made $200,000 in my first four years of blogging, I receive a ton of emails and inquiries on a daily basis. Lot’s of times people want to work for me in some fashion, but others simply want to know how they can replicate my results online. 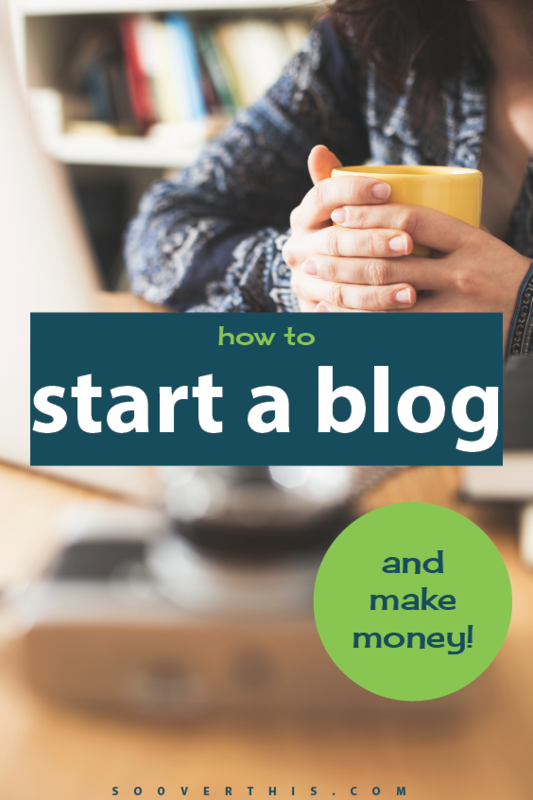 The question I am often asked is “How can I make money online?”, to which my answer is always the same…Start your own blog! This often leads to the second most asked question I receive “How do I start my own blog?”, to which my answer is laid out below! This is the single most important step in starting up your website. The short answer is that you want Self Hosting and to use the WordPress Platform. Now allow me to explain in a bit more detail. Too often people are afraid of spending a few dollars to setup their own hosting with a company like Blue Host. Rather, they start up websites on a shared and free hosting provider like Wix, Weebly, and even WordPress has a shared/free hosting option as well. You can recognize these sites by their domain name strings like this: www.example.wordpress.com, www.example.weebly.com, etc. The problem with those types of hosts is that you are limited in site customization, and most advertising and affiliate networks will avoid you like the plague! Meaning, you will most likely make little to no money unless you have a self hosted account. Not to mention that Google views these types of shared hosting sites with less distinction and authority, meaning they will never gain good search engine traffic/traction. Unfortunately, many people don’t do their homework on this aspect and after 1 year of creating content and building up their website they want to then transfer their site to their own hosting using a company like Blue Host. That would then make their domain URL like this: www.website.com. At this point they will lose most of their authority and search engine traffic because it’s a whole new site, and they are essentially starting over from scratch again. I have seen it happen to many people time and again, so don’t make this mistake! As for the platform itself, WordPress is the way to go. They are far superior to other options like Blogger. 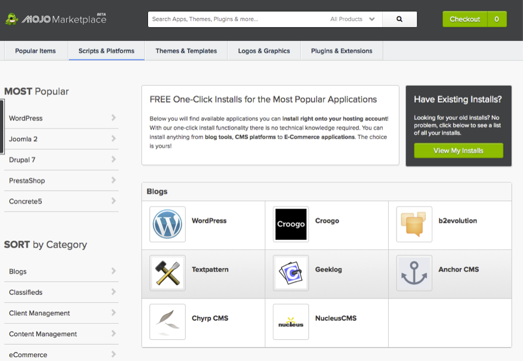 WordPress has the most customization available, and they have the most plug-ins available as well. Plug-in’s are for coding dummies like myself. Rather than writing code verbatim into the platform you simply download someone else’s plug-in that allows you to do many cool things like automated social media postings and analytical traffic summaries. Again, allow me to provide the short answer first… pick Blue Host! Now, here is the more detailed answer on why I suggest using them. Pricing – While I advocate steering clear from the free and shared hosting options, it doesn’t mean I recommend paying an arm and a leg for your first website. You can see your 3 standard options below. While “plus” is the most popular option, I would recommend the “basic” plan for all beginners just starting their first site. 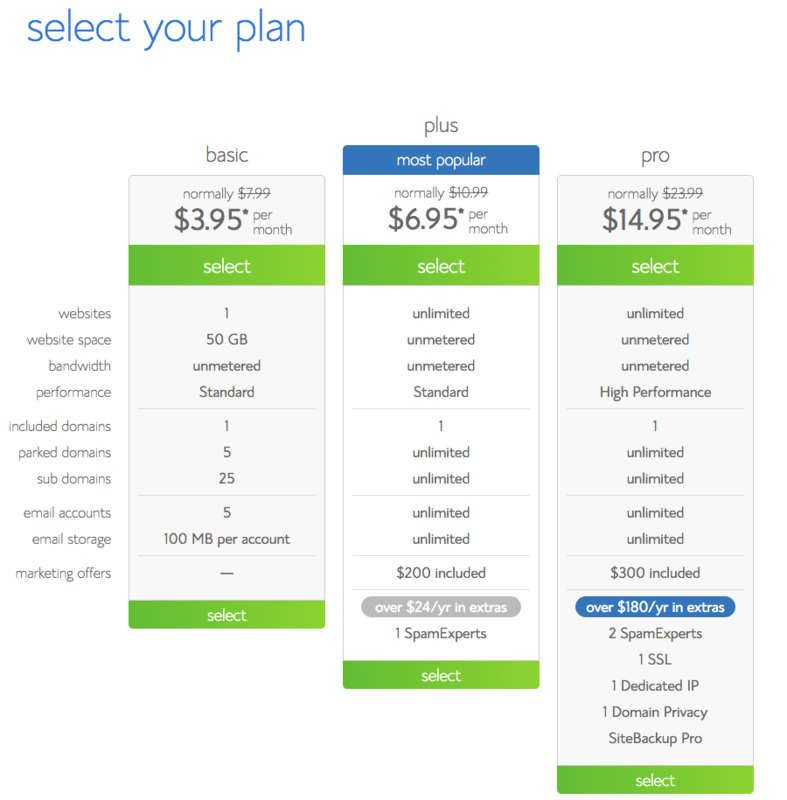 This comes with a free domain name as long as you purchase a 12 month hosting plan. This also includes 5 email addresses in case you want to create multiple emails if you are starting the site up with family or friends. Lastly, 100 MB of storage space is plenty for any new site. As you create content and require more storage in the future you can easily select a pricier plan at that time. Reliability / Uptime – When you start a new website you need all the help you can get to establish a loyal audience base. Any sort of downtime or slow site loading speeds will draw users away from your site. You want to keep them on your site for as long as possible, and retain them as recurring readers. Uptime is a common measurement for all hosting providers, and it is basically the amount of time you can expect your site to be up and running functionally without hosting issues. Blue Host has a proud uptime rate of about 99.9%. Most weeks and months are actually at 100% uptime. The only thing you should have to worry about as a blogger is…blogging! Far too many hosts experience technical issues and an abundance of downtime. Ease of Use – I mentioned before how technically deficient I am, and that is not an exaggeration. The common misconception is that every site owner is a genius coder with an abundance of technical skills…I actually have little to none. In fact, I almost gave up initially because I had a hard time figuring out how to actually “start” the website. I purchased the 12 month hosting package through Blue Host and didn’t revisit the process for nearly a month because I was feeling daunted by the whole process. I eventually decided to use their online chat through their website to sheepishly ask what to do next. That’s when their customer service team walked me step-by-step through the entire website creation process. It took about 15 minutes to complete the whole process. One mistake I see often regarding advice on “how to start a blog”, is that webmasters usually suggest registering your domain first. I say, Hold ON! By purchasing the basic 12 month hosting package through Blue Host, you are entitled to your own free domain name. This takes out the trouble of linking your domain and hosting services together, which is just another added and unnecessary step. Not to mention, this option is FREE! You can see from the screenshot below you can simply type in your requested domain name to see if it’s available. I had to make about ten attempts before I found an available one that I liked. You can also choose your website extension, i.e. com, net, info, biz, etc. I would HIGHLY recommend going with a .com extension. It’s an old school and trust worthy choice, and despite the hoopla of some recently created extensions, my personal preference has always been .com. 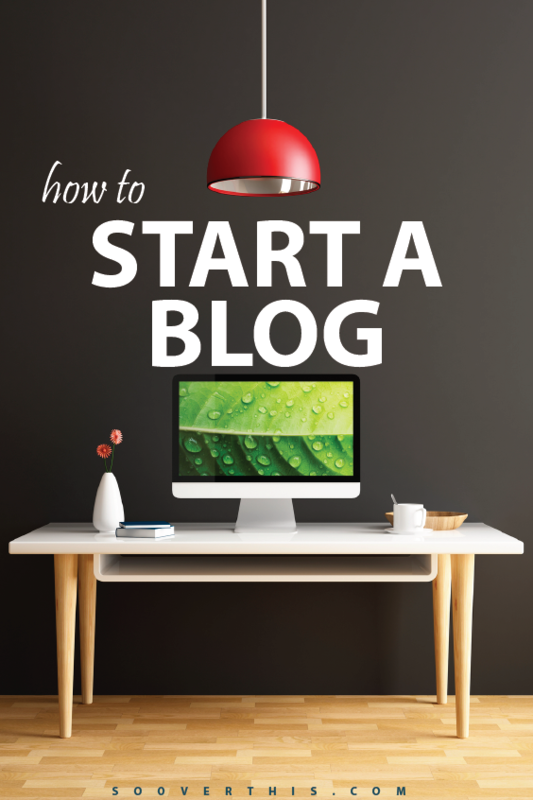 Remember back to Step 1, which was choosing a blogging platform? Well, this is the step in which you implement it. Believe it or not, I was SOOOO bad at everything technical, that THIS was the part I got hung up on years ago when first starting. 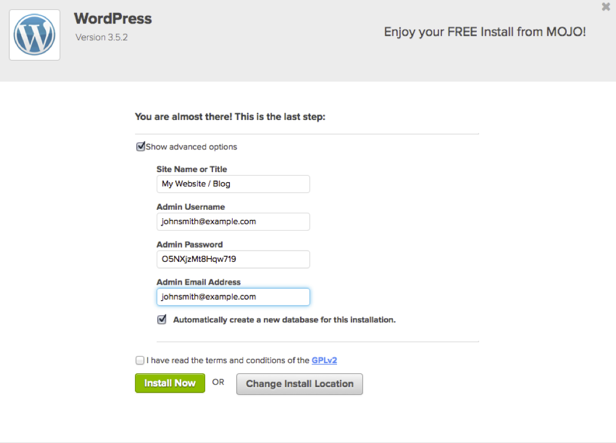 But pay attention to how easy it is to install WordPress. After you you have completed step 3, you will receive an email receipt for your new Blue Host account as well as a login to your “cPanel” account. cPanel is exactly what it sounds like, your Control Panel for your hosting account. Second, find the section titled “Mojo Marketplace”. This is an easy new application that lessens the number of button-clicks to setup WordPress. Third, scroll over to the section titled “Blogs”, under which you will see a button icon titled “WordPress”, which I have included a screenshot of below. Fourth, a screen will open asking which domain you want to install WordPress on. This is very easy since you should only have one domain available, the one you just registered. LASTLY, you simply fill in the blank lines below with your desired info and click “Install Now”. This is just the standard username and password selection, along with your desired email address.